Michael Regan/Getty ImagesLeicester owner Vichai Srivaddhanaprabha looks on following the Premier League match between Leicester City and West Ham United at The King Power Stadium on May 5, 2018 in Leicester, England. The owner of Leicester City Football Club, an English Premier League soccer team, died after being involved in a helicopter crash just outside of the stadium. The crash occurred at around 8:30 p.m. local time (3:30 p.m. EST) on Saturday. 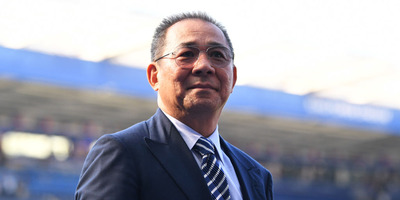 The team confirmed Vichai Srivaddhanaprabha’s death, along with 4 others. According to the BBC, witnesses said the helicopter had just cleared King Power Stadium, the team’s hometown stadium, before spiraling and crashing. The billionaire owner of Leicester City Football Club, an English Premier League soccer team, died after being involved in a helicopter crash just outside of the stadium. Vichai Srivaddhanaprabha, along with two of his staff members, the pilot and another female passenger, died when the helicopter crashed outside the stadium, the team confirmed. The crash occurred at around 8:30 p.m. local time (3:30 p.m. EST) on Saturday.